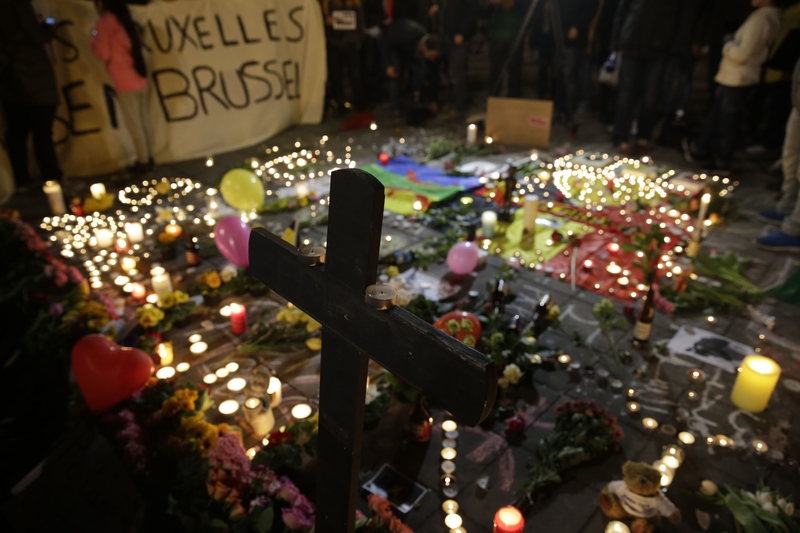 More than 30 people were killed in a series of attacks around the city of Brussels, Belgium, on Tuesday morning. At least 200 others were injured, as two explosions occurred at the Brussels Airport and a third took place at a subway station in the middle of the city. By late Tuesday night in the United States, only one Brussels victim, Adelma Tapia Ruiz, had been identified by local police. The 36-year-old Peruvian mother of twin girls had been living in Brussels for about nine years. She arrived at the Brussels Airport on Tuesday morning to catch a flight to New Jersey, where she had planned to visit family and attend her sister's wedding. Her two daughters, Maureen and Alondra, were supposed to travel with her. The three-year-old twins survived the attacks with minimal injuries. According to The New York Times, Maureen had shrapnel wounds in one of her arms, but Alondra was unharmed. Tapia's husband, Christopher Delcambe, was also injured in the attack. Although he was not traveling with his family, Delcambe had been at the airport to see them off on Tuesday morning. 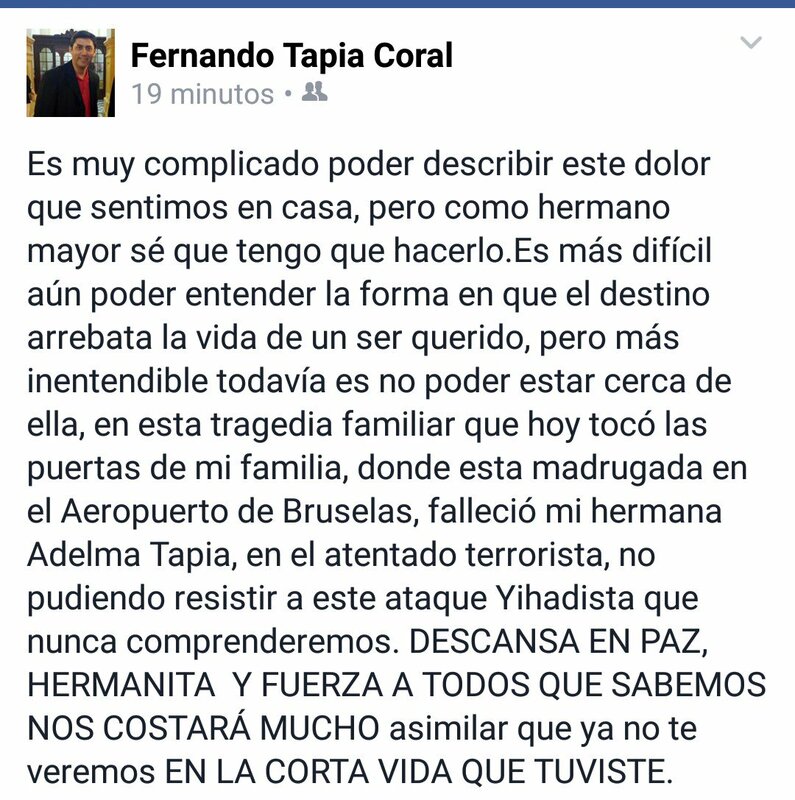 Tapia's death was confirmed on social media Tuesday evening by her brother, Fernando Tapia Coral. "It's very complicated to describe this pain that we're feeling at home, but as an older brother I know that I have to do it," Tapia's brother wrote on Facebook. Tapia reportedly had three sisters and two brothers. Her family is from Pucallpa, capital of Peru's Ucayali region in the Amazon rainforest. According to CNN Español, several other Latin American citizens were reported missing in Brussels on Tuesday following the tragic attacks. All in all, more than 30 people had been reported dead by Belgian officials, although Tapia's name is only one to have been released. The Wall Street Journal has reported that at least nine Americans were injured in the attacks. ISIS, the extremist terrorist group also known as the Islamic State, claimed responsibility for Tuesday's attacks. The attacks came fewer than five months after another ISIS-inspired series of attacks. In that episode, 130 people were killed in a coordinated string of suicide bombings and mass shootings around the city of Paris in November. A major suspect in the Paris attacks, Salah Abdeslam, was arrested in Brussels on Friday after spending approximately four months on the run and in hiding. On Tuesday, Brussels police reported that they were actively seeking the whereabouts of at least one suspect.